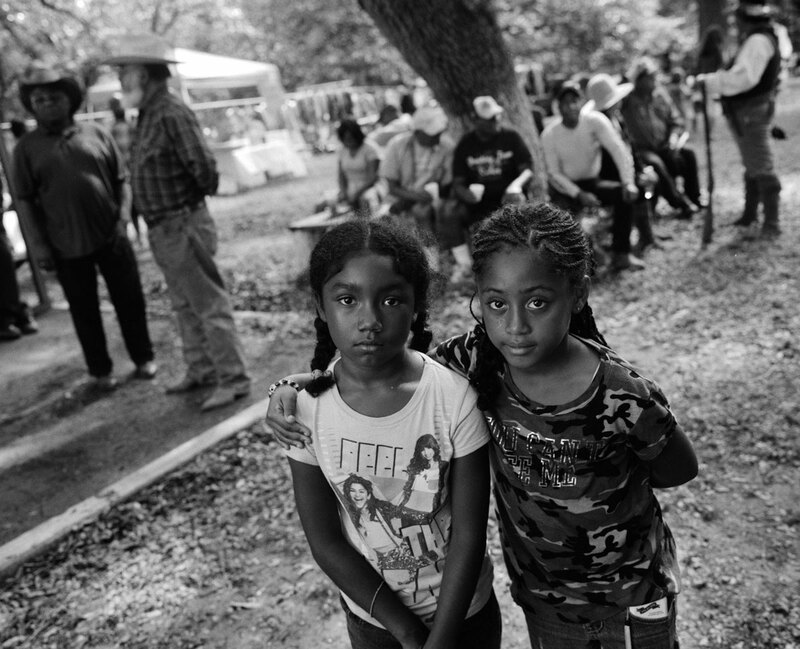 I took this photograph of two young girls at an annual barbeque for the black Seminole in the small south Texas town of Bracketville. All the Seminole living there are descendants from a few families of United States cavalry scouts that defended the U.S.-Mexican border in the 1870’s. The story of the black Seminole is the story of an epic American journey. Slaves from the plantations of South Carolina would escape into the wilds of Florida and join the Seminole Indian tribe, becoming full members and valued warriors. This migration was a great threat to the American slave owners, and two wars were fought to conquer the Seminole lands. Like most of the other southern Indian tribes, the Seminoles were finally forced into a brutal trek to Oklahoma in the 1840’s, where some poor land had been set-aside for them. But once there, Americans would raid the reservation seeking out darker skinned former slaves, kidnapping them, and selling them back into slavery. Under the leadership of John Horse, many of the black Seminole fled to Mexico where they were given land by the Mexican government. After the Civil War, some of the returned to the United States when they were offered jobs as scouts for the United States Calvary along the Texas border. From South Carolina to Florida to Oklahoma, to Mexico and back to Texas, these brave men and women fought and survived across the American frontier, redefining what it meant to be African, Indian, and American. When I saw these two girls, I knew I had to take their picture. In their faces I saw a history of this country that is not as neat and clean and as easily defined as our racially obsessed society would have you believe. People are people. Put them together, and they will mix and mingle and find joy and laughter in life despite all attempts to deny it to them.